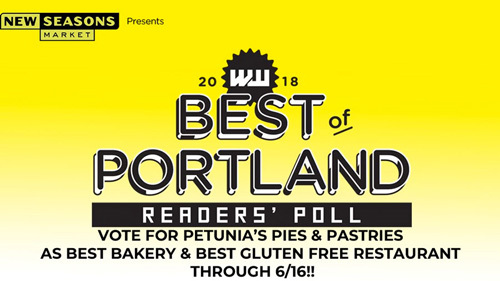 We are SO excited to announce that thanks to our fans like you, we have been nominated for Best Bakery and Best Gluten Free Restaurant in Willamette Week’s Best of Portland Reader’s Choice Awards! With your help, we can win! Cast your vote for Petunia’s NOW through 6/16!!! Vote HERE Thank you, we love you guys!